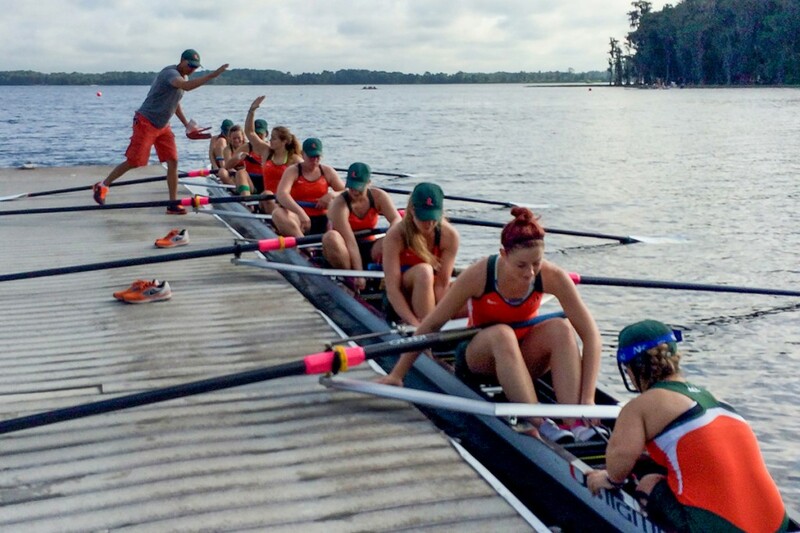 The women’s rowing team at the University of Miami drills motivational phrases into the minds of the athletes every day. “Make fast choices” and “Do everything with purpose” are two of its favorite mantras. These words emphasize the importance of speed while getting the team ready for racing season. Six mornings per week, the Hurricanes wake up before the sun rises. Before most students open their eyes, the rowing team has already finished a mile-and-a-half run and a two-hour row. After that, the team completes three extra afternoon sessions, including weight lifting and cardio. The rowers are not working out – they are training. This demanding regimen requires a positive attitude and a strong team dynamic. Fall races are long-distance. Each boat races against the clock instead of next to one another. In order to prepare for this, the team rows for miles at a time without stopping. The Hurricanes will compete in four races this fall season: a scrimmage against the University of Central Florida (UCF) and Barry University, Head of the Indian Creek, Head of the Charles and Head of the Hooch. This is the first year UM will host two races at their home course in Miami Beach. The scrimmage against Barry and UCF will be on Oct. 4, and the Head of the Indian Creek will be on Oct. 12.